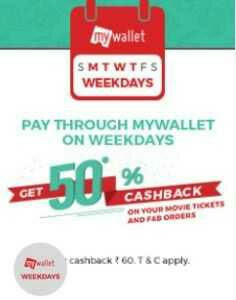 Bookmyshow is offering new mywallet weekdays offer where you can get 50% cashback on Paying via MyWallet + chance of 50% off too. -> This offer is valid till 6th April. So hurry up follow below steps & get this offer. • After successful transaction, you will get 50 % cashback upto Rs 75 will be credited soon in your bookmyshow wallet. - Each transaction needs to have minimum 2 movie tickets to be eligible for the offer. - From Monday to Thursday of each week, book movie tickets for any day in the same week’s Monday to Thursday, and get 50% cashback. - 100% payment should be made from MyWallet to be eligible for the offer. - Customers making partial payment using Winpins, Gift Vouchers, Promotional Codes or any other payment method apart from MyWallet, will not receive cashback. - Cashback valid on purchase of Movie Tickets and Food and Beverages only. - 50% cashback will be calculated only on the price of the movie ticket and Food and Beverage. Convenience fees, taxes and surcharges, PG charges etc. will not be taken into account for calculating cashback amount. - Offer valid only once per user per week. Counter will reset for each user every Monday. - Cashback will be credited post transaction to the user’s MyWallet account. - Cashback will be given as BMS Credits and will expire after 60 days from the date of credit. - BMS Credits can be used to buy tickets on BookMyShow. They cannot be transferred, encashed or used to buy Gift Cards. - BookMyShow reserves the right to withdraw or modify this offer at any time without prior notice. In case of any dispute, the decision of BookMyShow will be final.